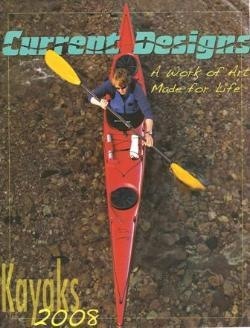 It's fun to see the evolution of Nigel's work in kayak design. 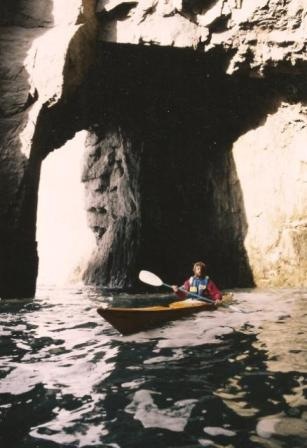 The idea for the first, the Vyneck came during an early solo kayaking trip around Cornwall. 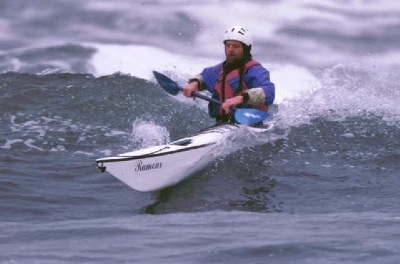 Nigel worked closely with Keith Robinson and with the Adur Centre (S. England) to produce a fast, straight-tracking expedition kayak in a class of its own, with performance way before its time. 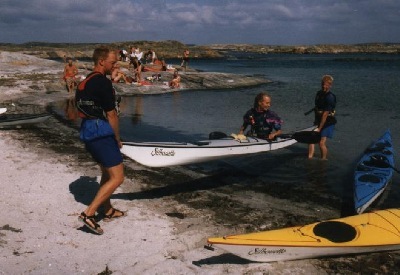 Nigel used the Vyneck for many of his early expeditions, such as his Iceland circumnavigation in 1977, and his Baffin Island to Labrador trip in 1981. Several years later, the Legend, followed by the Silhouette and the Shadow came onto the scene. Next, the concept design Rumour and it's rough-sketched larger partner the Echo. A small number of the original Rumours spread around the world until Current Designs officially launched it in 2006 after a few design tweaks. 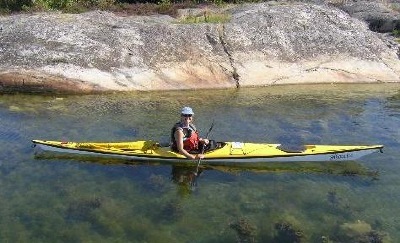 Three expedition-capable sea kayaks designed for easy and fast cruising. The Shadow, sized for the larger paddler, the Silhouette, tailored to the smaller paddler, and the Legend, Nigel's own all-round favourite for expeditions. 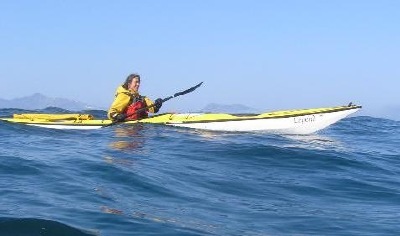 All are available from Seaward Kayaks. The Legend is a more stable and nimble version of the classic Vyneck. 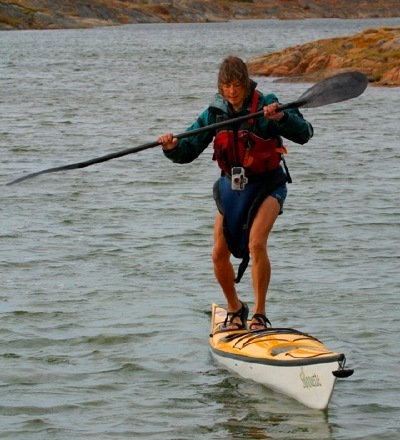 Both Nigel and Kristin Nelson chose to paddle a Legend on their 675-mile wilderness trip in the summer of 2004 to Northern Labrador. For one they needed the carrying capacity for a 5-week supply of food, for there were no stocking up places on their route where they could possibly replenish supplies. They would also expect the full gamut of weather conditions and awkward landings. The Legend was also Nigel's choice for demonstrating his hallmark precision techniques in his 6-part Sea Kayaking DVD series. The shallow-arch hull between hard chines is a classic Foster design feature. The early Silhouettes (like this one) had a small "ocean" cockpit. Standing on the back deck of the Silhouette is regarded by some as tricky. It takes practice, good attitude and a ready smile! The Shadow, out-maneuvering even the Legend, is designed with more stability and a better fit for the kayaker of slightly fuller figure. Like the Legend and Silhouette, the Shadow offers plenty of comfort room for the feet. 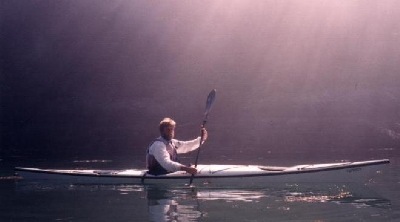 Legend, Silhouette and Shadow are produced in Canada as "Nigel Foster Kayaks" by Seaward kayaks. You can learn more about them at www.fosterkayaks.com. fits neatly into the protective recess ahead of the front hatch. In this position it is easy to read from the cockpit without the paddler moving their eyes far beneath the horizon; an important consideration in rough seas and on long crossings. Pictured here on the cover of the Current Designs 2008 catalogue, the Rumour is featured in the "Greenland style" section. 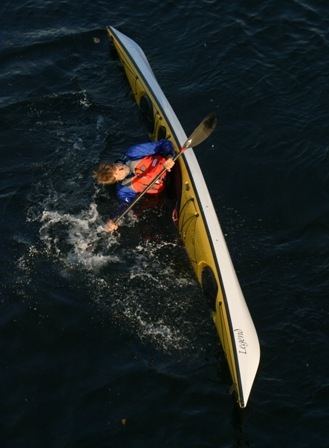 ...well described as a fast low-effort cruising kayak, aimed at smaller paddlers up to around 160 pounds. As built by Current Designs (as pictured, left and below) the Rumour differs a little from Nigel's original Rumour (seen above on the wave); it now has a tad more volume, especially in the stern, a slightly larger cockpit, and a little more initial stability. You can watch Nigel paddling his original version in Justine Curgenven's DVD, "This is the Sea Volume 1", exploring the spring-fed rivers of Florida in search of manatees. The Rumour measures in at 16 feet, with a 19.75 inch beam and a maximum depth of 12 inches. Kids love the Rumour too! Whisky16 prototype during early on-water tests in China. 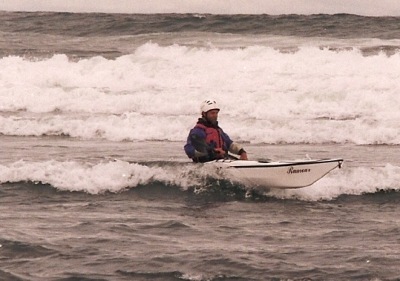 In January 2008 Nigel announced the Whisky16, a rough-water playboat for surf, current and rock-gardens. 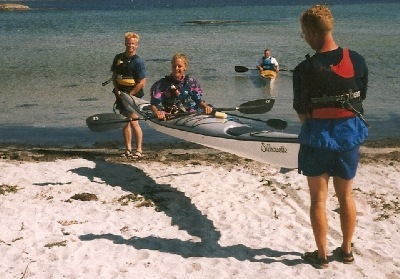 Here major criteria were the ability to spin the kayak around at a moments notice, and reassuring stability. Certainly a fun kayak, fitted with two oval hatches, an offset day hatch and a "whisky-hatch" on the front deck accessing an under-deck compartment. Whisky16 prototype... comfortable edging, quick-turning. The DoubleShot (seen here as an artists impression) hit the water in prototype form in 2007. Stable, agile and fun, it's an interesting tandem designed to play where the singles go. Designed by Nigel Foster and built in high quality by Point65, it features a shallow arch hull with hard chines, easy-access cockpits and five bulkheads, with five hatches to access the storage compartments.